The World. Ways to pray for needs of a global nature, or to direct prayer at a specific country, whether or not United Brethren people are involved there. International Partners. Prayer needs involving people, churches, and ministries in the nearly 20 countries with United Brethren churches. UB Global Staff. Prayer needs involving the UB Global personnel serving around the world. Volunteers and Trips. Prayer requests regarding overseas trips, seminars, and other matters involving volunteers. Our monthly Mission Link spotlights news and resources in the world of missions. 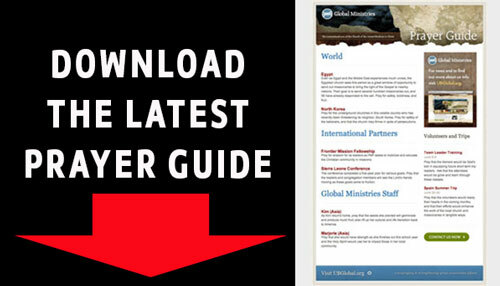 Both the Prayer Guide and the Mission Link e-letters are sent monthly. Sign up using this online form.